Proponents of the infamous ‘pay and add as you go method’ usually ignore one of the most important elements of running a business: value. When it comes to growing and future-proofing your business, you want to make sure that you can build on the infrastructure you invest in. If that means splashing out a little more cash in the beginning, then you want to ensure that the features it provides you with will be relevant for your business later. In this blog, we will explore the competitive advantages of SAP Business ByDesign, and the way you can integrate it with your business today, but also in the future. We hope to take you on an in-depth analysis of its most important features that will allow you to think about the value it adds to your business, without looking at just the cost of its subscription. This ERP is perfectly suited for medium sized companies looking to find an all-encompassing cloud solution, as it offers them the configurability and flexibility that they don’t necessarily know they need yet. This might sound somewhat confusing, but it essentially means you are getting access to all the most important tried-and-tested modules without having to worry about whether you will need them yet. In short, they form a package which is worth much more than the sum of its individual parts, as these could end up costing your business vast amounts of money (and time) if you sought them out elsewhere. Furthermore, because the software all comes as a package, they provide a high level of integration and compatibility that is hard to beat with other ERP’s. Let’s face it, knowing exactly what you need and when you need it is difficult in today’s volatile and often unpredictable economic climate. Why waste time painstakingly planning out what you will need in the future when this is liable to change anyway? Well, that’s where the real strength of SAP Business ByDesign lies. It’s not only quick to implement, but it’s longevity and deep functionality means that it’s the perfect framework for your business to grow into, without overreaching your capabilities. It’s the only guaranteed way to leverage a configurable solution to unforeseen problems and tricky situations and, as a result, will help your company grow sustainably, without any hidden costs down the line. Add to that the deep analytical possibilities, and you have a transparent platform that is truly built to last. Having extra modules and benefits is one thing, but if they don’t add any further value to your business, they aren’t worth very much. 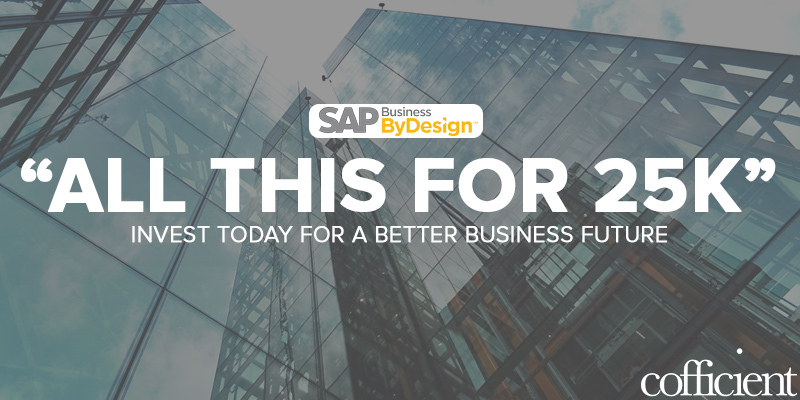 Fortunately, with SAP Business ByDesign, they have taken the most important functions and necessities and squeezed them into one of the most feature-packed suites on the market. When it comes to Finance, for example, you have up to date cash flow management tools that allow you to take a managerial, birds-eye view of your business finances, which in turn allows you to make the right decisions at the right time. CRM systems are also intricately interwoven with marketing, sales, and service specific functionality, allowing you to go from the front office to the back-end in the blink of an eye. If that isn’t enough for you, you have got project management, human resources, procurement, supply chain management, globalisation functionality and industry specific functions – all at the click of a button. Sounds pretty comprehensive, right? Access to this full suite of software is vital if you are serious about enhancing and optimising your business systems and workflow. The applications are virtually limitless, but more than that, they offer an integration with your other systems and processes that would otherwise be far too expensive and complicated (if choosing other ERP solutions). As a result, it’s the age-old dilemma of value versus cost that dominates this conversation. In our opinion, it’s not so much a dilemma, as we are convinced that any business concerned with its longevity and growth will choose value over cost. Any day of the week. Contact Cofficient for a demo of SAP Business ByDesign or any of our other solutions.